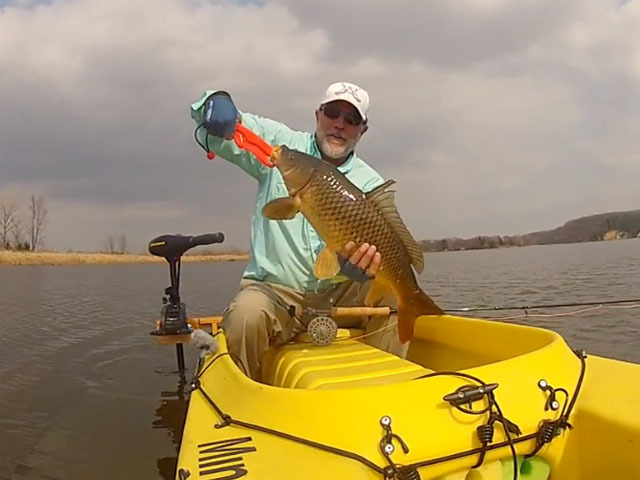 A little known technique in the inland north country is sight fishing for carp with a fly rod. It is EXACTLY the same as fishing for redfish on a saltwater flat somewhere. 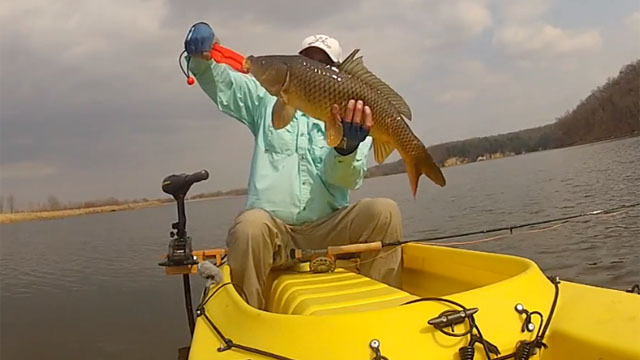 Having the ability to fly fish from a kayak allows you to reach ‘skinny water’ very quietly, which is essential when fishing for carp. The stability of the ‘W’ is perfect for stand-up casting, and for landing one of these beasts if you are fortunate enough to hook one. This particular spot has only been open water for about a week. It’s been a long winter. 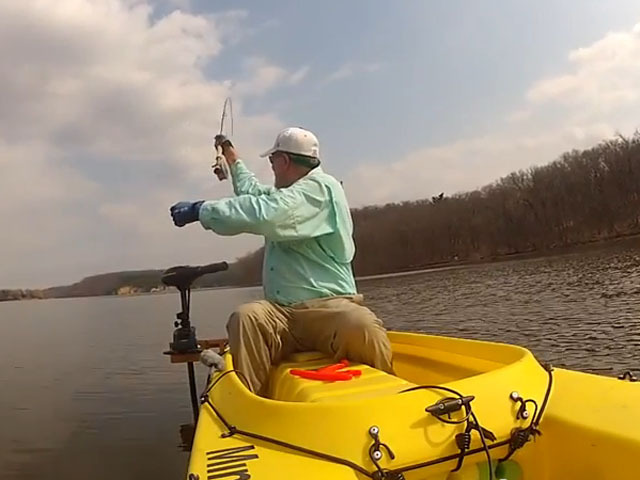 The water was relatively clear, with no wind, and partly sunny skies…perfect for sight casting! It took 15 minutes or so to spot my first fish. It was pretty far away, so I had to guess as to which end of the shadow was the head of the fish. A perfect cast, but a wrong guess! The next cast was in front of him, and he hit it immediately. The battle was on! 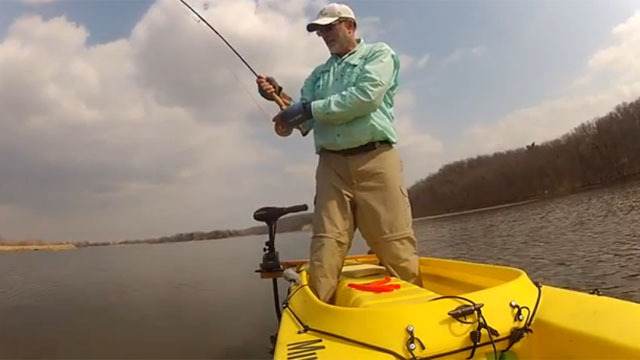 I liked the way you swung your fly rod over your head when the fish swam behing the kayak – You must be quite agile, and I guess fishing out of a wavewalk kayak helps too.. It looks like a red, you can fish for it like a red, but doesn’t look like it fights like a red. I bet it doesn’t taste like a red either. 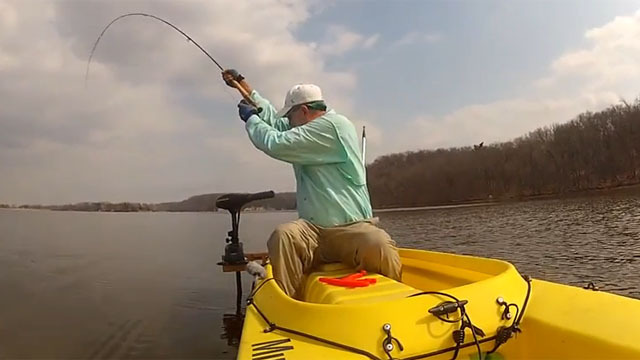 Anyhow, Gary, I did a little bow and arrow fishing for carp as a kid back in Wisconsin, and your way looks like a whole lot more fun. Lots of my friends target and have tourneys for carp fishing. I tangle with them only from shore, time to change that. I’ll have to give that a try. This is a really nice clip. Thanks!